Robbers stole nearly £40m of items from a London jewellers in what police say was Britain's second biggest robbery. Two men with handguns threatened staff at Graff jewellers in New Bond Street on 6 August before taking 43 items. They dragged a female member of staff outside as they left the shop and fired a shot, although no-one was injured. CCTV images of the two men have been issued. The £40m haul is exceeded only by the £53m raid on a Securitas depot in Kent in 2006, a Met spokesman said. Det Ch Insp Pam Mace from the Flying Squad said: "This was a well planned robbery with a number of vehicles used to help the robbers escape. "These men are extremely dangerous and fired at least two shots in busy London streets as they made their getaway. "Someone knows who these men are, they would undoubtedly have spoken about it beforehand or boasted about it afterwards." 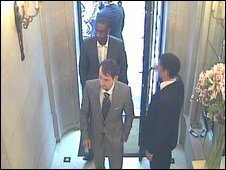 The "smartly dressed" pair escaped in a blue BMW. They fired once while leaving the store and then again in Dover Street where they abandoned the BMW, police said. The robbers then got into a silver Mercedes and drove into Farm Street where it is believed some of the suspects got into another vehicle, possibly a black Ford Galaxy or Volkswagen Sharan. 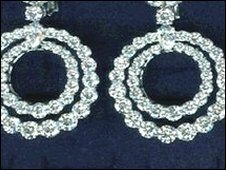 One of the 43 items of jewellery stolen was a pair of white round diamond double-hoop earrings. A yellow diamond flower necklace, a platinum white Marquise diamond ring and a Chronograph men's watch were among the other pieces taken. The first suspect is described as white, about 30 years old, slim and between 5ft 10ins and 6ft tall. The other man is described as black, in his 30s, 6ft tall, more well- built than the first suspect, with very short hair. The same store has been targeted by robbers before. Jewellery worth an estimated £23m was stolen in a raid in 2003 when two Serbs armed with a revolver held up staff. And in 2007 jewellery worth as much as £10m was taken from a branch of Graff Diamonds in Sloane Street in central London by two men posing as customers.